BALTIMORE - It should have been a bit confusing to Jason Bay. Not that the Pirates don't get their share of fans on the road - OK, they don't - but it should have been somewhat odd to hear the ovation from the crowd of 40,429 last night at Camden Yards when he smashed his second home run of the game. While Bay fist-bumped with Kevin Youkilis and the rest of the Red Sox crew in the third-base dugout, there was quite the show of appreciation from the home (er, road) fans. "To be honest with you, it didn't even occur to me at that point that we were on the road," Bay said. Not that it was all that surprising to the rest of them, of course. The Sox are used to this. And used to beating Baltimore (13 of their last 19 meetings), which they did last night behind another ace-like performance from Jon Lester. That, of course, is nearly a given these days. 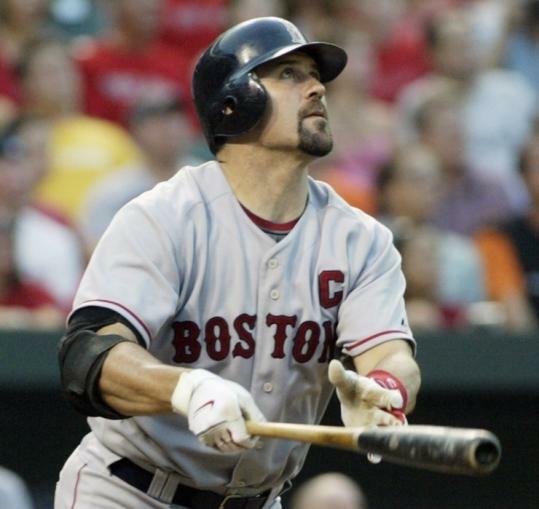 The burst of offense from Jason Varitek is another story. Needed, though, as the Sox try to turn their 6-3 win last night into a recurring theme against the American League East (against whom they play 27 of their final 37 games). Because the Rays have shown, thus far, that they're not going away, and the White Sox and Twins are making an AL wild card far from a given. "We've got to win games," David Ortiz said. "It's the last six weeks of the season, and we're kind of close to first place. Tampa Bay is playing some unbelievable baseball, so we've got to win games." So while Varitek was coming up with a rare home run, it was Bay who was demonstrating yet again what kind of offensive force he can be. With an eighth-inning poke over the short wall in left-center, Bay recorded the 12th multihomer game of his career, and his two-run shot gave the Sox a 4-1 lead. "That's a big part of my game, going up the middle, the other way," said Bay, who finished with two homers, four RBIs, and a stolen base. "I just kind of got a little pull-happy, and so we talked today, and tried to get back to staying out over the middle. "I definitely wasn't trying to hit home runs that way, but that's usually what happens. You're not trying to, you're just trying to keep it simple, stay up the middle, and all of a sudden - boom - you catch a couple." As to how Ortiz got on base ahead of Bay in the eighth, it was a fielding error by Kevin Millar that put him there. And Ortiz wasn't quite happy about the scoring decision. "I thought I got a hit," Ortiz said, laughing. "Come on, man. Seriously. I almost killed that guy." While Ortiz was joking his way through interviews, there seemed to be a bit of relief across the clubhouse at Varitek's locker. Not only did he reach twice (though he also struck out twice), but his hit was a lefthanded home run, not exactly a commonplace occurrence for the catcher. Batting lefthanded against Jeremy Guthrie, Varitek belted a home run that went 362 feet, over the out-of-town scoreboard in right field. It had been a long time. The captain had gone nearly three months - his last coming May 21 against Brett Tomko - since hitting a home run from the left side. "Good, it felt good," Varitek said. "Need to fight every once in a while for one at-bat throughout a game, one or two. So maybe it will start coming together." Mired in a deep slump, which has dropped his average from .295 to .215 over 63 games, Varitek has hardly hit from the left side. He was batting .202 with a .328 slugging percentage coming into last night. As a righty, his natural side, he stood at .260 with .377 slugging. He has hit seven of his nine homers this season from the left side, though he hadn't hit one at all since July 21. But he got one, and sometimes that's enough. Meanwhile, Jon Lester's only blemish was a home run just over the wall in left-center by Aubrey Huff that left the pitcher with a one-run lead, 2-1, in the fourth. Even within those confines, though, the powerhouse lefty allowed just two other singles through six innings, plus a one-out double in the seventh. And, in doing that, Lester continued his streak of bullpen-saving performances. With rest needed for a relief staff that had to finish Sunday's game after Josh Beckett went just 2 1/3 innings, Lester got through the seventh for the eighth consecutive start, and improved to 6-1 following a Sox loss. "He's standing out there like he's 6 foot 4, lefthanded, strong kid," manager Terry Francona said. "I'm sure if you ask him, the game slowed down for him. "He's accumulated some innings, he's got some experience, he executes pitches. He gets it and throws it a little quicker than he used to. He's got that cutter, he's got some two-seam movement with some velocity behind it. He's got a lot of ways to get you out." When the Orioles finally got a second baserunner to second, on the seventh-inning double by Millar, Lester got tougher. The pitcher turned in a curveball that had Luke Scott swinging, missing, and swearing, as he whacked his bat against the ground. One out later, Lester was out of the inning. The three-run cushion he left with, though, didn't last all that long. Jonathan Papelbon allowed his first eighth-inning hit this season (in 11 at-bats), a double by Huff that scored two runners inherited from Manny Delcarmen (both walked). That left the Sox with just a one-run lead at 4-3, but they took care of that in the ninth. Ortiz stroked a run-scoring double, sending Dustin Pedroia home, and came home himself on a fielder's choice grounder by Bay. That's the same Bay who was asked, given his time languishing in Pittsburgh for most of his career, exactly how long it's been since he was in the middle of a pennant race. He smiled.